Prison Terminal: The Last Days of Private Jack Hall breaks through the walls of one of America's oldest maximum security prisons to tell the story of the final months in the life of a terminally ill prisoner, Jack Hall, and the hospice volunteers who care for him. 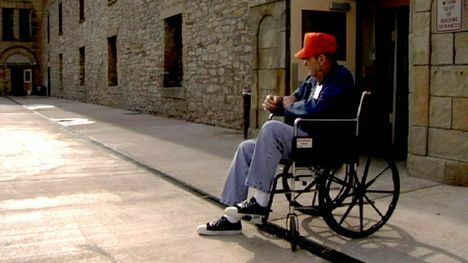 The film draws from footage shot over a six-month period at the Iowa State Penitentiary and provides a fascinating , often poignant account of how the hospice experience can profoundly touch even the forsaken lives of the incarcerated. documentary short, Prison Terminal: The Last Days of Private Jack Hall. Documentary: How did you get started in documentary filmmaking? Edgar Barens: Back in the 1970s film schools weren't necessarily the rage they are today. So I was pretty clueless when it came to studying filmmaking. When I was a freshman at Southern Illinois University, I took a general studies course in cinema appreciation. This was a dream come true, since I was steeped in film—mostly foreign film—from an early age. Batavia, Illinois. This early exposure to quality filmmaking was instrumental in my development as a filmmaker. After acing the cinema appreciation course at SIU, I asked the instructor if there were any other film courses I could take. He pointed me in the direction of the film department, so I enrolled there and over the next couple of years, I made documentaries and experimental narrative films, and eventually graduated with bachelor's and master's degrees in film and photography.Thanks to my politically active parents and family in Europe, the move to making social issue documentaries was a natural progression in my filmmaking career. D: How did you first hear about the hospice program at the Iowa State Penitentiary? prison-based hospice program. 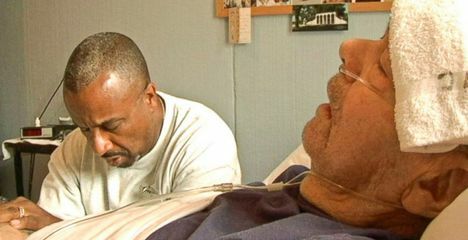 The film was distributed to hundreds of correctional facilities and was used as a teaching tool to jump-start prison hospices around the country. I shot that documentary in a couple of weeks, at the Louisiana State Penitentiary in Angola. While I think that film was well made, I always felt that I had short-changed the guys in the program by not having the time to really get to know them. Ten years later, I discovered a new prison hospice program at the Iowa State Penitentiary that was implementing the prisoner-run aspect of the Angola prison hospice. I proposed to ISP to embed me long-term into their prison so as a documentary filmmaker I could truly focus on the men and women who made their hospice program run. D: How did you decide upon Jack Hall as the main character in your film? its toll on him. After a few weeks in the infirmary, Jack made the decision to sign the DNR (Do Not Resuscitate) form and enter hospice. 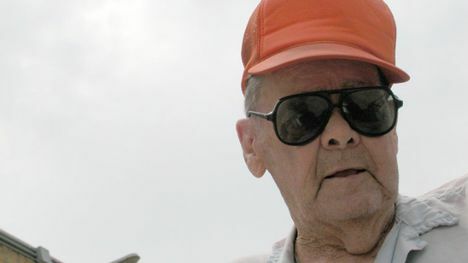 I got to know Jack prior to his hospice days—mainly his back story and war stories, and some stories about his crime and his family dynamics. I really never thought Jack was going to be the focus of the film, but after his bout with pneumonia, it became clear he was the person I was going to follow through the hospice process. I got his permission to follow his story until and past his dying breath, as I did from his family members who would visit him on a weekly basis. Jack was fortunate to have a loving and understanding family who also allowed me to film their most poignant moments with their ailing patriarch. D: Filming in a correctional facility poses its own set of challenges, the most complicated of which is access. How did you present your film to the authorities and convince them to give you the green light? EB: Initially I requested to live in a cell, if at all possible, to truly embed myself in the prison culture. The ISP thought that was a noble idea, but one fraught with too many insurance implications. So the administration offered me one thing better. Across the street from the prison sat three ranch homes. The warden lived in one of them and the doctors lived in another. The administration offered the basement of the doctors' houses, so that's where I set up shop. From there I could come and go at will, around the clock, to film Prison Terminal. Another dream come true for an indie filmmaker! D: What were the ground rules that they presented to you? prison, since I was determined to stay in there for the long haul. That's not to say I didn't wander a bit and film scenes that were not necessarily hospice-related; I had to, in order to establish the prison and its culture as the backdrop to this amazing program. D: You documented some extremely sensitive and intimate scenes—the most profound of which is Jack's passing. Talk about the process of gaining the trust of the medical staff, the inmates and especially Jack and his son. Instead I would get to the prison very early in the morning and stay until very late in the evening. This way, the medical and correctional staffs and the prisoners would get used to seeing me, see that I was dedicated to the topic, and gradually trust me. This was the first time in the history of ISP that a camera was allowed behind the walls for an extended period of time. So I recognized the unbelievable gift of access that I was granted, and I did not want to jeopardize it in any way. Eventually, most of the medical staff and security staff accepted me, though there were always a few who were very wary of having a camera around the workplace. I knew that rumors that I was a government plant made their rounds around the facility. But eventually the folks recognized that I was a dedicated filmmaker who really cared about everyone who worked behind the walls. I bonded with Jack's family by meeting them during their weekly visits. He was fortunate to have his family nearby. So it was a matter of time that they got to know me, got comfortable with me and trusted me well enough to film their final goodbyes with Jack, as well as his death. D: Talk about documenting the vigil over Jack, and his passing. How did you prepare for that experience? How long did that shoot take? How did it impact you, emotionally as well as spiritually? EB: When it's apparent that an inmate's death is imminent, the 24-hour vigil kicks in. This is the time when there is a prisoner hospice volunteer in the room 24 hours a day for as long as it takes. Additionally—and this is one beautiful benefit of prison hospice—the biological family can be present, no matter the hour, to witness the passing of their loved one. So once it was clear that Jack was going to pass, the vigil process began. I think it lasted about two days before he finally succumbed. This meant that as a documentary filmmaker I had to be present around the clock in order to capture his final moments—something I felt was extremely important to show. Death, no matter where it occurs, is a moment we all have or will share some time in our lives. So for me, it was the great equalizer moment, where we all see that at the end of the day, no matter what horrible things this person may have done, death is a sacred time that needs to be respected and if possible celebrated—especially for the family left in its wake. On the technical level I always had at least two to three hours of extra batteries—and a clear mind. I would confer with the medical staff to get their assessment of Jack's status, so that I could grab a cat nap in the infirmary. But I would never leave the infirmary, just in case Jack took a rapid turn for the worse. Herky [one of the inmates] and I stayed with Jack around the clock for the last two days of his life. And during those days Jack was visited by most of his family and friends he had made within the prison. Having the camera and the technical preoccupation kept me from truly feeling Jack's death at the moment it occurred. I knew that the moment of his death was important to have on film, and he knew I would be filming it, as did his family. Once it became clear that Jack had stopped breathing, I know the immensity of that moment really hit me hard. While I was trained as a hospice volunteer prior to making this film, I had never truly witnessed a death until Jack's. So it hit me hard. Thankfully I was filming with the flip-out screen and not filling my eyecup with tears; it was a very sad, but liberating, moment for everyone in the room. The most difficult part after Jack's death was to keep on filming the process of what they needed to do to his body prior to discharging it to the funeral home. I was basically working on adrenalin at that point, since I had not really slept in two days, but I needed to document more crucial hours after Jack's death. That was tough, and both physically and emotionally taxing. Instead of sleeping that night I fainted in complete exhaustion. surprising or unexpected about their reactions? as to extol the benefits of this prison hospice model. I wanted to use one man's personal journey through hospice as an example of how such a no-to-low-cost program could be used throughout our correctional system, and not only provide dignity to a dying person but also foster rehabilitation and compassion among the prisoners themselves. I would much rather use a personal story to generate social discourse on an important issue than make some facts-and-figures-type film that could prove to be a disservice to the cause. Most people were surprised that a program like the one documented in Prison Terminal is unique and were unaware that most prisoners die shackled to a hospital bed offsite with no visitors allowed, or alone in a prison cell or in the prison infirmary. Prison Terminal is an eye-opening film that will force people to think about what happens to people in our correctional system. With 2.5 million people behind bars in the US, there are millions of family members outside who must grapple with the death of their incarcerated loved one. D: The short documentary form is a challenging one for which to find an audience outside of the festival circuit. Aside from the March 31 airing on HBO, how have you been reaching your audiences? What are your future plans for Prison Terminal? To have the HBO broadcast is an amazing opportunity to reach millions of viewers. This way they can see first-hand the benefits of a prisoner-run, prison-based hospice program and possibly make the next move to creating their own. I also plan on screening the film in community hospices, colleges and universities as well as houses of worship. Additionally I have a great distributor, Cinema Guild, that will guarantee the film will be seen far and wide throughout the US' educational and correctional systems. I am also looking into foreign distribution of the film because I know most of the world would be amazed that not only do we not release prisoners who are terminally ill, but we have actually created a humane program that compensates for our punitive ways. Prison Terminal: The Last Days of Private Jack Hall will be screening on as part of IDA's annual DocuDay, Saturday, March 1, at 9:00 a.m. at the WGA Theater in Beverly Hills. For more information and to purchase tickets, click here.